The transmitter unit (left) and receiver unit (right) of one instance of SCP-2672. Special Containment Procedures: Recovered SCP-2672 instances are currently stored in a standard containment locker at Site-49. Access to instances of SCP-2672 in containment requires Level-3 authorization. Recall notices for "Watchful Eye" brand baby monitors consistent with SCP-2672's appearance have been posted to stores carrying instances of SCP-2672. Monitoring software has been installed on these stores' point-of-sale systems; all automated alerts triggered are to be immediately investigated and any discovered instances of SCP-2672 seized for containment. Foundation agents assigned to SCP-2672 are to routinely investigate stores in areas surrounding their given location for additional manifestations of SCP-2672. Description: SCP-2672 is the collective designation for all instances of an anomalous baby monitor radio system marketed under the brand name “Watchful Eye”. Each instance of SCP-2672 consists of a transmitter unit (equipped with a microphone) and a receiver unit (equipped with a speaker). 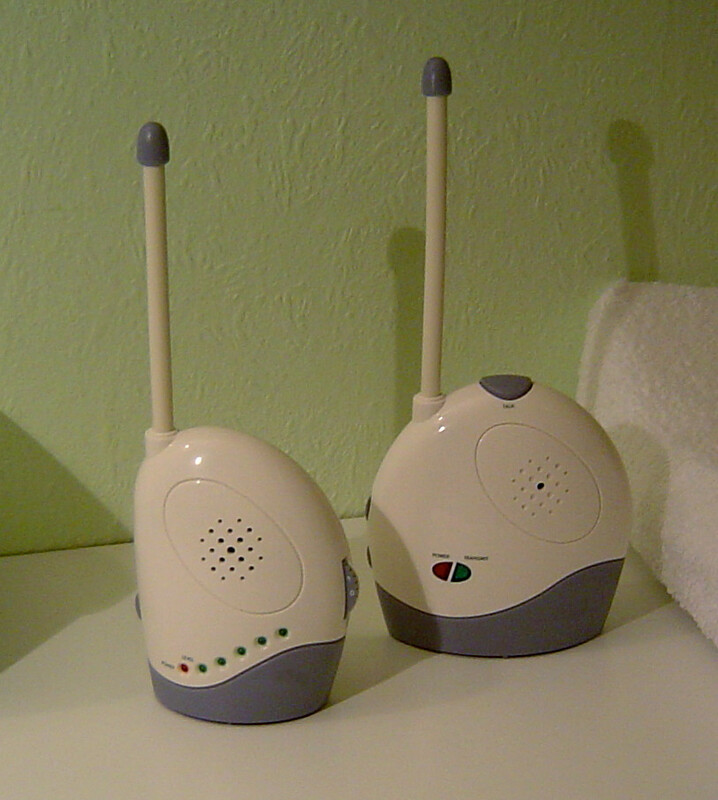 SCP-2672's anomalous properties manifest when the transmitter unit is placed in a room with an infant two years or younger and the receiver unit is placed in a room where only the mother of said infant can hear its speaker; when not in this configuration SCP-2672 functions like a normal one-way radio. Once this configuration is achieved, at seemingly random intervals1 the speaker will emit sounds of the baby in extreme distress. This transmission is highly variable in content; some have simply been sounds of the baby crying at high volume while others have included voices of unknown people that appear to interact with the baby in abusive or threatening ways. The actual baby, however, remains unharmed and seemingly-unaffected; additional non-anomalous recording units placed near the baby have picked up no trace of this transmission. Once the mother moves out of hearing range of the speaker, the anomalous transmission ceases. Routine cross-object investigation has revealed that SCP-2672 shares similar branding with SCP-2453; however, the earliest instances of SCP-2672 predate those of SCP-2453 by approximately 10 years. As with SCP-2453, there was no record of how SCP-2672 instances were delivered to stores or how the product was entered into each store's inventory system. When interviewed, employees of affected businesses reported observing no unusual happenings and further reported never noticing any childcare products branded differently from the stores' usual stock. Records indicate that SCP-2672 was first distributed in stores in approximately 1999. However, the nature of the anomaly meant that many affected mothers heard the transmission, immediately ran to check on their child, and upon discovering them unharmed assumed that (a) they had imagined the transmission or (b) their child had simply calmed down. While some affected mothers – largely those that had heard additional voices in the anomalous transmission – did complain to the stores that sold them SCP-2672, these actions were infrequent enough that SCP-2672 only came to Foundation attention in 2006, when the anomalous transmission changed to include a seemingly-prerecorded message. This additional recording is played before every anomalous transmission and consists of an unidentified male voice threatening the baby's life if the mother does not listen to the entire transmission without leaving; see Addendum SCP-2672-A for more details. As before, the baby is unharmed and unaffected regardless of whether these instructions are followed. After this change in behavior, related police reports increased dramatically and SCP-2672 was discovered and contained. Don't move, Laura. Not a muscle, not at all, or she'll be lost forever and there will be nothing you can do. What happens next, whether she survives, is entirely in your hands. The only way you can save her is to sit down, now, and listen. Listen. It will be… unpleasant. You will want to run away, perhaps plug your ears. This will be her unmaking, as surely as if you were doing this to her yourself. Understand that no matter what you hear, the consequences of disobedience will be a thousand times worse. So sit and listen, or I swear to you that the next time you see her – if you ever see her again – will be the last. Don't be selfish. Don't be foolish. Sit. Listen. Listen. Junior Researcher Hernandez's child has shown no signs of being affected by this incident in any way. On 07-21-2007, Foundation agents recovered an instance of SCP-2672 from the house of Alice ████████ after she experienced an anomalous transmission and filed a police report. In this report, Mrs. ████████ noted that she had listened to the entire transmission as instructed and had recognized a voice in the background as that of local resident Lawrence Reed, who lived 2 miles away. A Foundation investigation revealed no contact between Reed and Mrs. ████████'s baby son but did uncover that Reed had been repeatedly physically abusing his own infant son. A followup investigation was started to analyze existing recordings of SCP-2672's anomalous transmissions obtained during testing. Thus far, nine transmissions containing background voices have been successfully voiceprint analyzed and traced back to a source. All of these sources have been people living within 10 miles of the SCP-2672 instance that produced the transmission in question, and all have been found to have committed serious physical abuse to a child in their care. A proposal has been submitted to establish a series of “listening stations” using instances of SCP-2672 in major cities as a way to proactively seek out the sources of these transmissions. You are wasting our work. This is unacceptable. We are neither monsters nor idiots; once we realized it was not having the desired effect, we tried to make the obvious change. We said, clearly and thoroughly, that they were about to hear the cries of another's child and that they must listen carefully to pinpoint its location. And all of our testing revealed one very simple fact: They wouldn't do it. They did not have the mental fortitude to save a child that was not their own. Often they would simply turn it off before we had even finished speaking. They were foolish and selfish. So we forced their hand, made them do the right thing. We offer no apology for the effectiveness of our actions. If you do not restore our work, we will be forced to proceed down an alternate path. We hope that you will see the error of your judgment before that happens; that you will keep an open mind and a full heart. But we will not be deterred in our purpose. It is unclear if the “alternate path” referred to is a reference to SCP-2453 or not. Dr. Hernandez claims to have no prior knowledge of this new recording and asserts she acted of her own volition. She is currently remanded offsite pending a disciplinary hearing. Researcher Welby was unaware of the unauthorized nature of the experiment and has been cleared for a return to active work. All further proposals to conduct further experiments on SCP-2672 are denied by O5 decree.